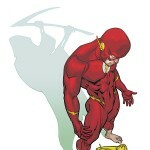 First off, Newsarama interviews Alan Burnett, whose 4-issue arc on The Flash started last week. He very carefully avoids giving out any spoilers, but talks about how he got the assignment and his history with reading The Flash. Former Flash writer Mark Waid, now Editor-in-Chief of BOOM! Studios, speaks with writer Rockne O’Bannon about his upcoming Farscape comic books at Newsarama. Monday’s Heroes featured the show’s first on-screen speedster, Daphne Millbrook. It was also a very good premiere. Season 3 is off to a much stronger start than last year. Todd Klein, who designed the first post-Crisis Flash logo in 1987, looks at dots and dashes in comic lettering, and how the typewriter gave comics the double-dash (--) instead of the more standard em-dash (—). Among his examples: the last issue of Flash Comics and the lead story from Showcase #4, the last and first solo Golden Age and Silver Age Flash stories. Speaking of Todd Klein, last Spring he wrote up a 4-part study of the Flash Logo from 1940 through the present day: Part 1 · Part 2 · Part 3 · Part 4. This entry was posted in Creators, Other Speedsters, Round-Ups and tagged Alan Burnett, Daphne Millbrook, Heroes, Interviews, Lettering, Linkblogging, Marc Guggenheim, Mark Waid, Todd Klein on September 23, 2008 by Kelson.